Dogs in Suds, a local leader in the canine grooming industry, is celebrating their 10 year anniversary this month. Ten years ago, founder Lauren Sobol opened Dogs in Suds out of her love for dogs. With over 18 years experience, she competitively shows dogs confirmation style in AKC and UKC competitions. Lauren is the proud owner of Sonny, an American Bulldog, Shar-Peis and French Bulldogs. 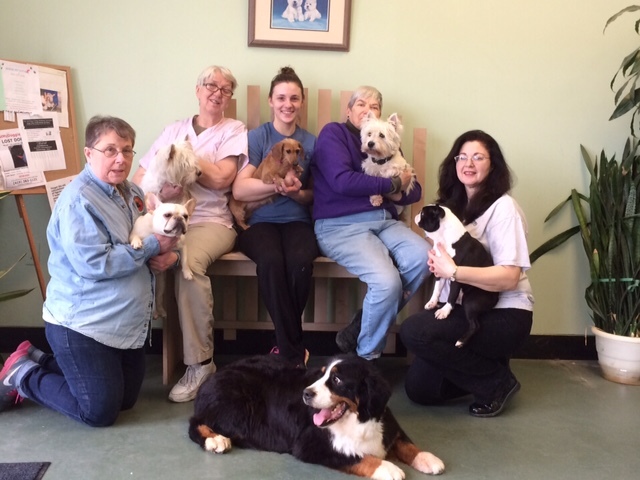 The knowledgeable, big-hearted people at Dogs in Suds is what makes this place so special. Pat is a 9 year professional grooming veteran at Dogs in Suds who has a gentle touch and loves making her dogs feel welcome and comfortable. Aside from grooming, Pat also participates in all of the local dog shows. Pat is a trainer specializing in agility, obedience, rally obedience and lure coursing. If you know Pat, you also know that she rescues pups and breeds them as well. Peggy is a professional handler and participates in over 35 competitive shows a year; most recently she took five dogs to Westminster in New York City. Peggy loves Afghan Hounds and Boston Terriers and finds herself specializing in large-breed dogs. Chelsea, involved with showing and handling dogs since the age of 10, has a big heart for her furry friends. She has a Bernese Mountain Dog and an American Bulldog at home and can usually be found grooming dogs with lots of hair! About Dogs in Suds: Dogs in Suds offers professional grooming and do-it-yourself services and has cost-saving customer appreciation programs in place. Frequent Toenail Trim Club: Normally $10 per trim, Save $5.00 when you visit every 4 weeks. Referral Program: We welcome and reward referrals with a 10% off discount on your next visit! Newly adopted dogs: Bring your new pup in within a month of adoption and we’ll help you celebrate with 50% off your first appointment! Copyright © Dogs In Suds, LLC, 2019.